Die Casting,In an environment where clients require minimal lead-times, the advantages of finding a single source who can machine, cast and finish the required components will reduce the management and logistic costs that often arise when dealing with a variety of subcontractors. The lead times will also reduce. An integral aspect of your competitiveness is that the machine company you choose to use has skilled personnel and the best equipment to ensure that it optimizes the productivity and quality of their processes. 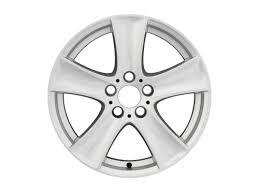 CNC Machining Services is a machine shop that would meet all your die casting needs. At CNC Machining Services, our personnel constitute professionals and specialists in the CNC machining of castings and are aware of the entire casting process. Essentially, the most important aspect of the process is inspecting the cast components. This would ensure that the output is of high quality. We also have the best equipment to suit your various needs. We use the most versatile and reliable tools available. We are also continuously investing in new technologies to improve the process. This ensures that we have the latest technology to improve quality and reduce the produce. The advantage of gravity casting in comparison to sand casting is that we achieve a better surface finish, and the mechanical properties are much better. It arises from the increased cooling speed that is common in gravity casting. We also have process controls. It entails the use of quality data and set-up records to guarantee the reduction of set-up times for castings and consistent production. We also have an in-house tool room. This allows for constant maintenance of the device and modifications. Furthermore, breakdowns ca be handled in-house, reducing the machine’s downtime. We have an excellent quality system, and every personnel is committed to providing high quality. If you require critical components, then we can provide dye penetrant, pressure testing and X-ray. We have over 20 years’ experience in die casting, and we can guarantee you of high-quality casts. We will be your partner for all your machining, casting and finishing requirements. Get in touch with use to discuss your needs. We utilize a state of the art machining systems and practices to ensure that you will have the best solutions for your matching needs in the industry. We can provide secondary machining operations such as milling, turning, cellular manufacturing and process equipment and machines. We can manage the largest casting we can produce. We use speed indexing, twin pallet loading, offline programming and rapid tool changing as a way to minimizes costs. Due to the tightly controlled costs, we are competitive on both large and small batches. The fixtures and jigs are first produced in our tool room. This allows use to develop a relationship between the machined and cast dimensions. 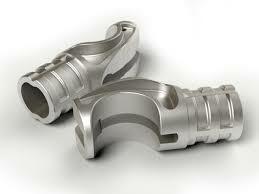 This reduces the amount of time between production of raw castings and production of the machined components. An advantageous aspect of working with a single partner occurs in the initial stages. This allows us to optimize the small components where we add the appropriate details into the casting itself. This way we can avoid issues that would cause production rate or quality problems. Even though we have the experience in machining of die castings that are produced at out foundry, we also deal with machining and finishing components that have been cast by other processes that we cannot manage at out our facility. We can also provide you with machining services from solid or extrusion. It does not matter the volume that you require, we can deliver. The casting technology uses steel molds and cast iron that enables the zinc and aluminum castings to be manufactured more cheaply and accurately in comparison to sand castings. The tooling costs are a fraction of those required when dealing with pressure casting. The rapid chilling allows for quality mechanical properties while the non-turbulent filling guarantees the manufacture of castings that can be treated with heat with little porosity. We have the experts and experience to ensure that your designs are optimized. This will allow for the elimination of components that would add unnecessary costs to the gravity casting. The innovative press trimming functions of the tool also minimize finishing costs. We also provide solidification and finishing simulations through the use of software and computer technology. 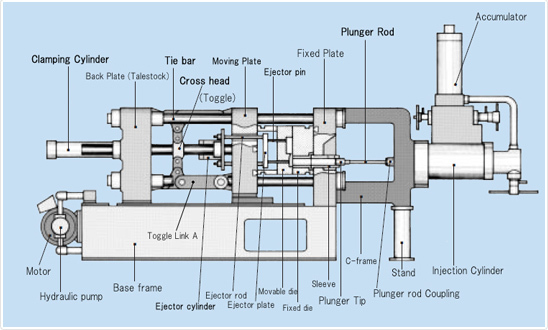 We have a variety of casting machine that is run by microprocessor controlled hydraulics. 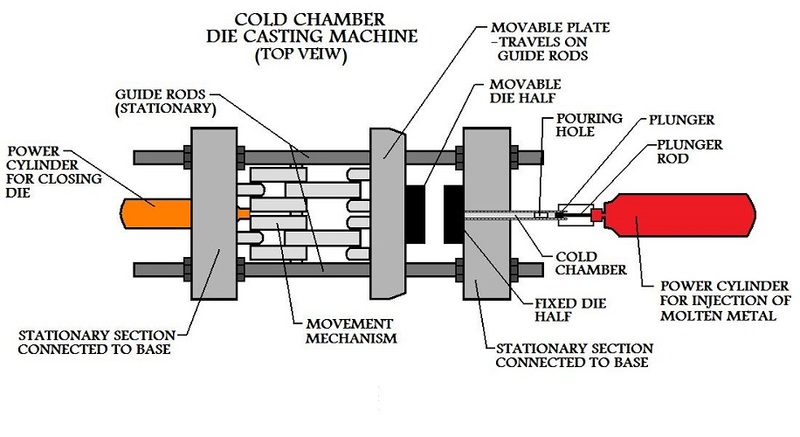 This automates the movement of the die, leading to an improvement in consistency and the production speed. The machine also has hydraulic movement and tilt pouring that can go up to four axes. We also have facilities where we produce sand cores. This is used in creating of complex internal shapes.